Aug. 18, 2018, the Coshocton County Farm Bureau proudly presented the first Dinner on the Farm, an elegant and unique benefit dinner, held on a local grain farm. The purpose of this event was to raise funds jointly for the Coshocton County United Way and Coshocton County Agricultural Impact Fund. All of the proceeds were donated equally between the two programs. The dinner raised over $6,000, which allowed Coshocton County Farm Bureau to present a check for $3,042.58 to Coshocton County United Way at its recent board meeting (pictured above). The Coshocton County United Way works to unite neighbors and resources to positively impact lives in the county. Their grant dollars support seven Community Impact Initiatives including: Dolly Parton Imagination Library, 2-1-1, Charity Tracker, Free Tax Preparation, FamilyWize Discount Prescription Program, Crunch Out Obesity, and Clean Up Coshocton. 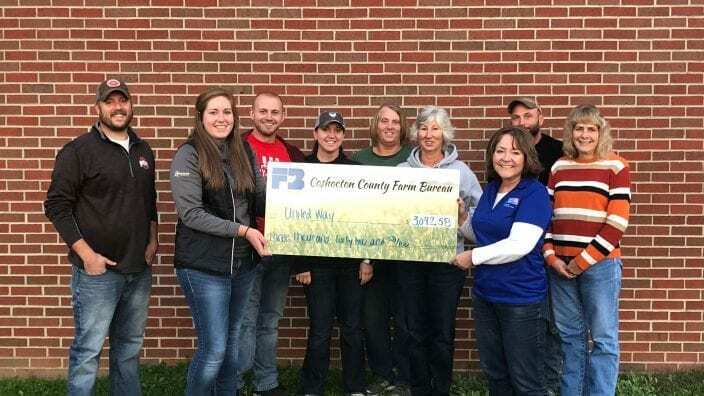 The Coshocton County Agricultural Impact Fund is a new fund established by the Coshocton County Farm Bureau Board to provide grants to applying recipients for agricultural education programming. Organizations wishing to apply must be school or government organizations or those with a 501(c)3 status. These include, but are not limited to, FFA Chapters, 4-H Clubs, Soil and Water Conservation District or OSU Extension. The second goal of this event was to entertain our guests with amazing food and help promote the connection of food to agriculture in Coshocton County. The county board would like to thank our Gold Sponsors: Heritage Cooperative, Scott Boyer Nationwide Insurance, Kaufman Realty and Auctions, and Three Rivers Energy/ Lakeview Grains as well as all of the silent auction donors and guests. Coshocton County Farm Bureau’s mission is to work together with Coshocton County farmers to advance agriculture and strengthen our communities.